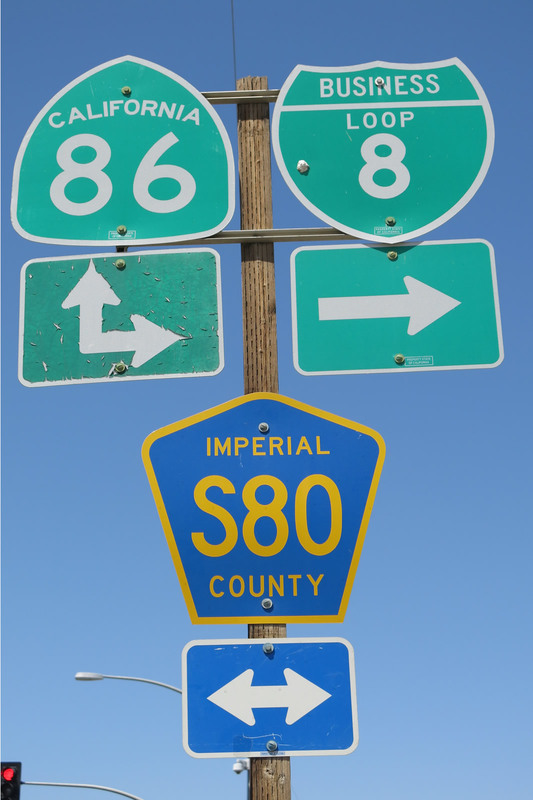 Business Loops from Interstate 8 follow old alignments of U.S. 80. According to the California Highways Page by Daniel Faigin, in the 1960s a business route was defined along Hotel Circle in Mission Valley. It is unclear if this business route was signed at the same time as the Washington Avenue / El Cajon Boulevard business route. This business loop began at the California 163 and Washington Street interchange and followed Normal Street and El Cajon Boulevard (old U.S. 80) back to Interstate 8 in La Mesa. A handful of reassurance markers appeared along the route within the San Diego city limits through the early 2000s. 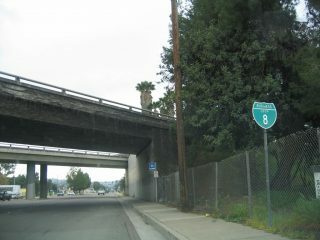 References to Business Loop I-8 from California 163 were taken down along northbound in 2001 and southbound in October 2005. One shield remains along the route eastbound as of 2016. Legislative State Route 163 at Washington Street via El Cajon Boulevard to Interstate 8 near Spring Street in La Mesa. Business Loop I-8 stretches 8.3 miles east from Exit 15 in El Cajon to Exit 23 near Lakeside. The route follows historic U.S. 80 along El Cajon Boulevard and Main Street through El Cajon and Highway 8 Business through the unincorporated area northeast of the city. Shielding for Business Loop I-8 appears only along the commercial boulevard within El Cajon. The remainder of the route is signed with street signs displaying “Highway 8 Business”. Interstate 8 near Chase Avenue over El Cajon Boulevard and Main Street to Interstate 8 near Oakdale Avenue. This omits the San Diego County section of Highway 8 Business. Unincorporated Alpine, located in the foothills east of San Diego, sees a 3.3 mile long business route from Interstate 8. The loop follows historic U.S. 80 (Alpine Boulevard) between diamond interchanges with Tavern Road (Exit 30) and Willows Road (Exit 33). Business Loop I-8 here was not inventoried in the 1991 state signing log. The El Centro business route for I-8 connects Interstate 8 with the city center along a 4.2 mile loop. Beginning at a trumpet interchange (Exit 114), Business Loop I-8 travels north along Imperial Avenue to Adams Avenue east. Adams Avenue (County Road S80 and old U.S. 80) takes the route east along side California 86 to 4th Street, which returns the business loop to I-8 at Exit 115. 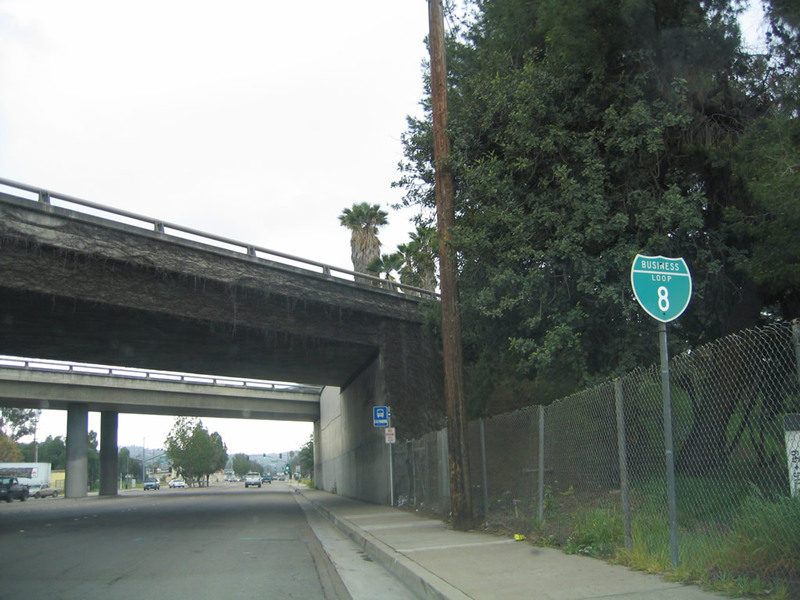 Interstate 8 and Imperial Avenue over Imperial Avenue, Adams Avenue, and Fourth Avenue to Interstate 8 and Fourth Avenue. A well signed route, Business Loop I-8 (Winterhaven Drive) arcs north from Interstate 8 through the community of Winterhaven between Exits 170 and 173. The route continues south across the Colorado River to 4th Avenue and the Yuma business district. Two miles south of U.S. 95 (16th Street), Business Loop I-8 curves east onto 32nd Street by Yuma International Airport (YUM) to reconvene with I-8 at Exit 9. 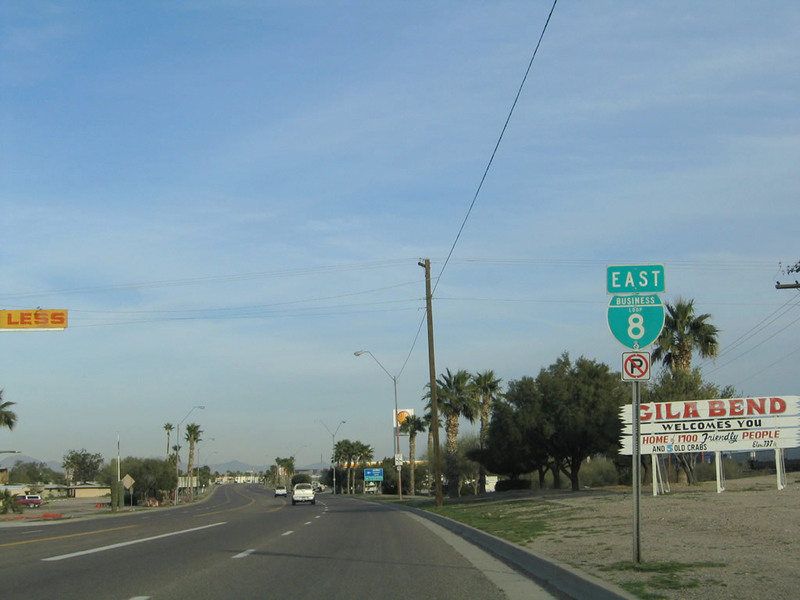 All of Business Loop I-8 between Winterhaven and Yuma follows the old alignment of U.S. 80. The California portion of the business route is not referenced in the 1991 state signing log. The 1998 Arizona State Highway System Log listed the Yuma portion of Business Loop I-8 as 11.93 miles. The Arizona portion varies between state and city maintenance. Sections along 4th Avenue and 32nd Street were transferred to the city of Yuma in September or November 2010 while the eastern extent between mileposts 11.50 to 12.66 was transferred to the city in September 2003. Gila Bend provides the first traveler services along Interstate 8 east from Yuma. Business Loop I-8 provides access to the town and a connection with Arizona 85 leading north to I-10 from Exit 115. The route lines Pima Street (old U.S. 80) east, partially with SR 85. Butterfield Trail angles the business route southeast from SR 85 back to I-8 at Exit 119. Guide signs for the Gila Bend exits on the Interstate 8 mainline display SR 85 or SR 85 and I-10 instead of the business route. 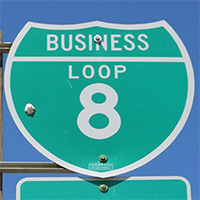 Business Loop I-8 is instead referenced on supplimental service signs, and has been since fall 1997. Alan Hamilton explained the signing as part of the ADOT policy to reduce sign clutter. The policy limits guide signs to no more than two shields or control cities, with additional routes or destinations posted on supplemental signs. Business Loop I-8 through Gila Bend was listed at 5.04 miles long in the 1998 Arizona State Highway System Log. Shields were posted along the route and at the intersections with SR 85 as of 2015.
Business Loop I-8 westbound on Main Street in El Cajon. Interstate 8 passes above. Photo taken 02/07/05. Gila Bend’s first eastbound business loop for Interstate 8. Photo taken 01/14/05.